Location: O'Learys Bar & Restaurant, Heron City, Stockholm, Sweden. 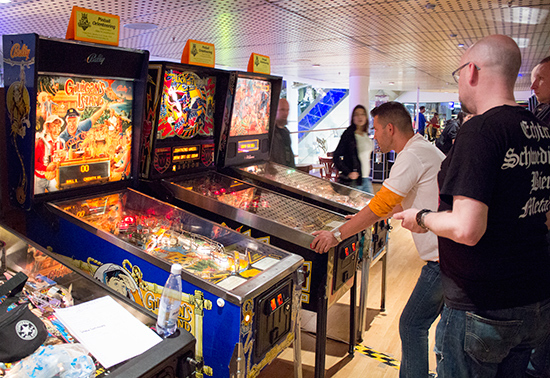 It's time for the annual European Pinball Championship, and once again we're back in Stockholm. 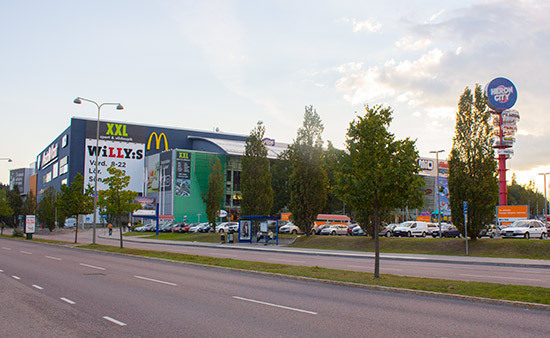 We were last here in 2007 when the EPC was held in the north of the city at the Royal Institute of Technology, but this time our destination is 20km away at the Heron City shopping mall in the southwestern corner. 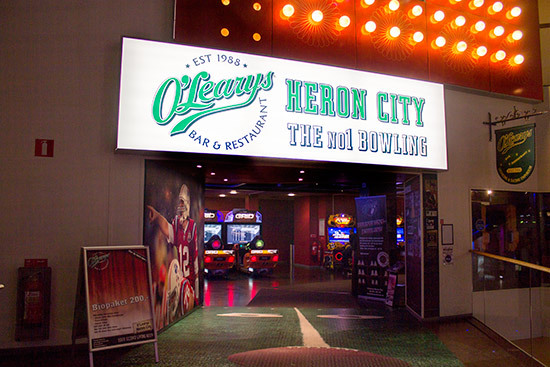 Heron City is a large mall, featuring a bowling alley, a food court, a multi-screen cinema, numerous shops, and the venue hosting the EPC - O'Learys Bar and Restaurant. 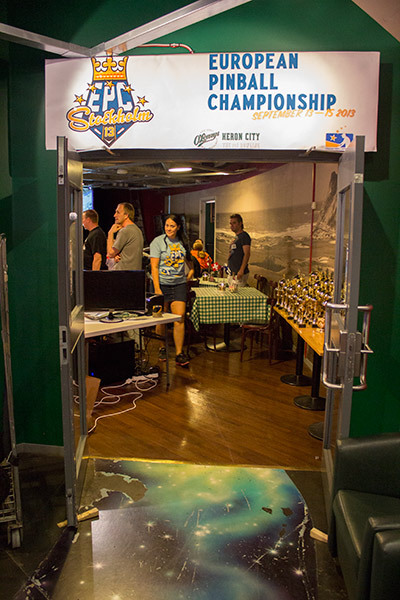 There were no signs outside O'Learys, anywhere in the mall, or at the main entrance to advertise the EPC, but then due to the size of the venue there were no real spectator opportunities either. So this event was being held for the participants rather than the public. And there were plenty of participants with 210 registrations, of which 192 actually turned up to play in the main tournament. 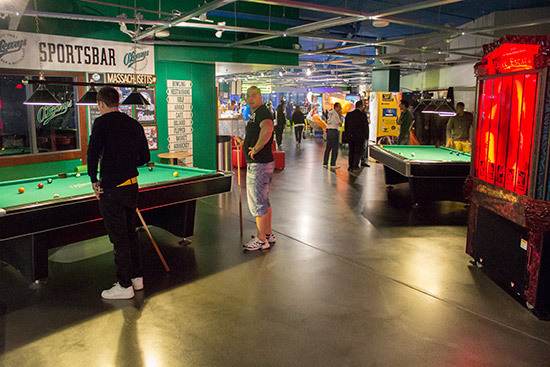 As you walked through the entrance towards O'Learys, the first area you entered was an amusement arcade which featured many of the latest video and redemption games, as well as pool tables, pinball machines and a cafe. 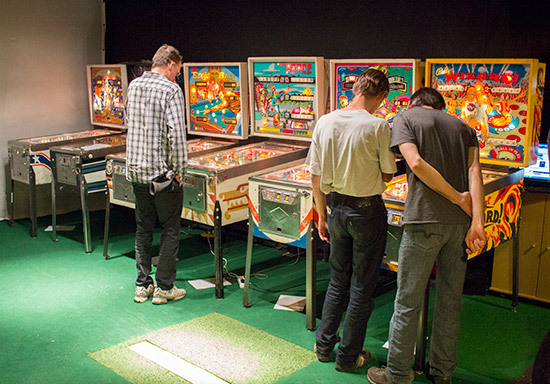 It was in the pinball area that the recreational machines were located, as well as those for the EPC side tournaments. With Sweden not part of the Eurozone, the currency here is the Swedish Krona or Crown (SEK). The arcade used a prepaid card system to add credits to the games. 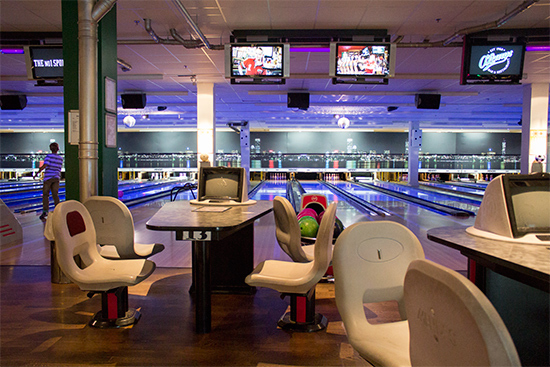 The pinballs mostly cost SEK12 (€1.40, $1.84, £1.16) for a 3-ball game, and the card cost SEK10 which was nonrefundable. 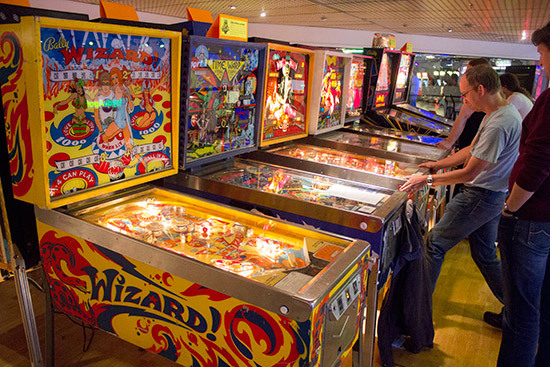 Next to them were several additional machines which were used in the side tournaments and for more recreational play. 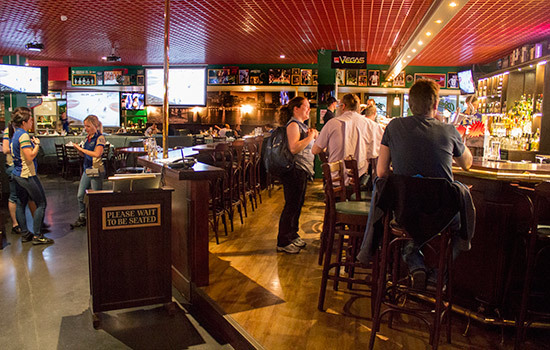 O'Learys itself is in a separate large room, with a long bar which served a wide selection of bottled and tap beers, assorted cocktails, as well as the usual range of soft drinks. 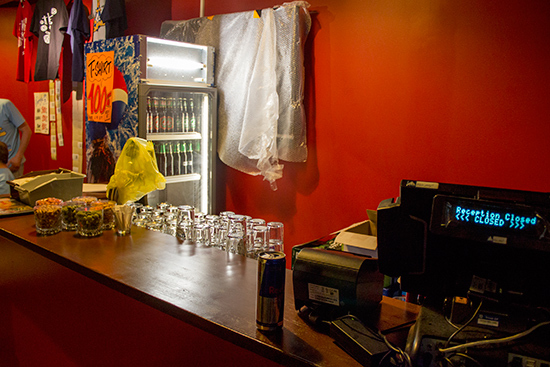 In front of the bar was a spacious seating area which was where the food was served. 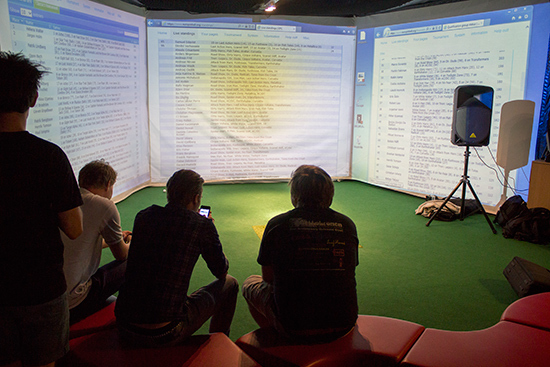 Large flat-screen monitors hung all around the room, showing a suitably European mix of football matches from England, Sweden, Italy and Spain. 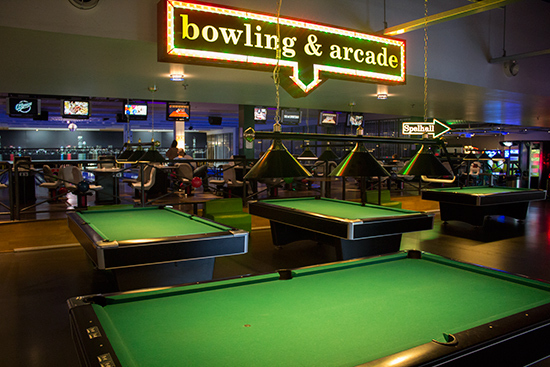 The EPC occupied a number of rooms to the left of the bar which appeared to be home to a mini-golf putting course when it's not filled with pinball machines. The main entrance was outside the bar, although there was also a direct path from the EPC area into the bar and restaurant. The entry desk was on the left as you walked in, and it was here players collected their player badges, paid any outstanding entry fees for the main tournament, the Classics, or the Team Tournament, and collected any T-shirts they may have ordered. 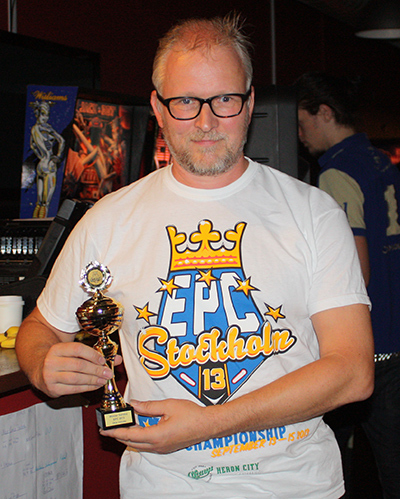 Entry to the EPC cost SEK300 (€34.55, $46.08, £28.98), the Classic Tournament was SEK200 and the four-member Team Tournament cost SEK100 per player. 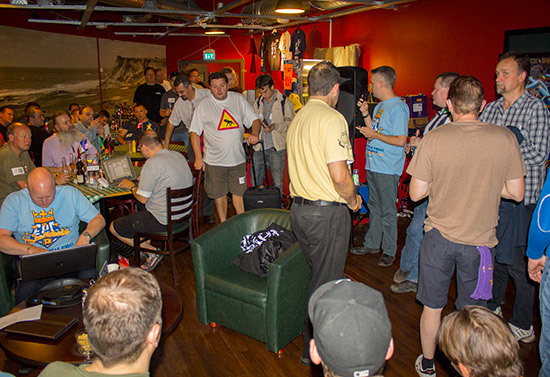 Commemorative EPC T-shirts could be pre-ordered, while there were also plenty of T-shirts from previous Swedish tournaments on sale for SEK100 (€11.50, $15.35, £9.66). 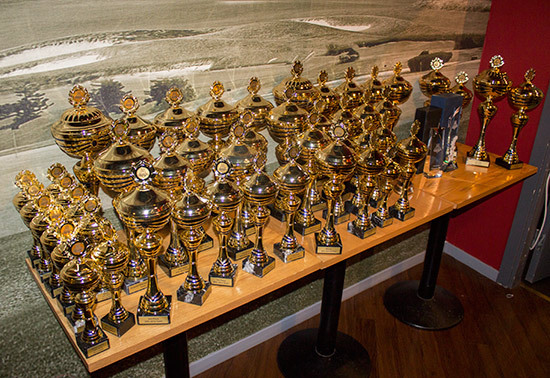 On the opposite side of the room, the numerous trophies for the main, classics, team and side tournaments were on display. 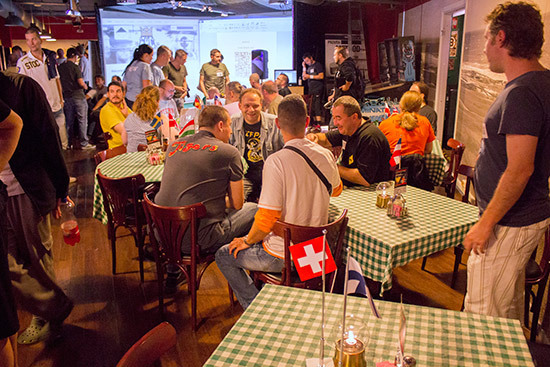 The rest of the room was taken up by tables and chairs, a small bar, and an area with three projector screens which would show the matches and results a little later on. The first rounds of qualifying were not due to start until 6pm on Friday, but players registered before that time and had the opportunity to visually check out the machines being used. 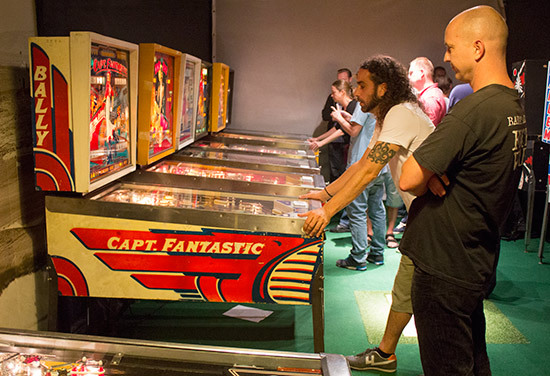 The condition of the games was very good, and there were many newer Stern machines in the mix, including Metallica, Avengers, X-Men and AC/DC. There was much activity before the qualifying matches were calculated and then finally announced to the waiting competitors. Qualifying for both the main EPC and the Classic tournaments were broken up into three-hour periods and players could choose in which periods they played their qualifying matches. The final rounds of the Classic Tournament were scheduled to start at 7pm on Saturday, with the main EPC play-off starting on Sunday morning at 10am. 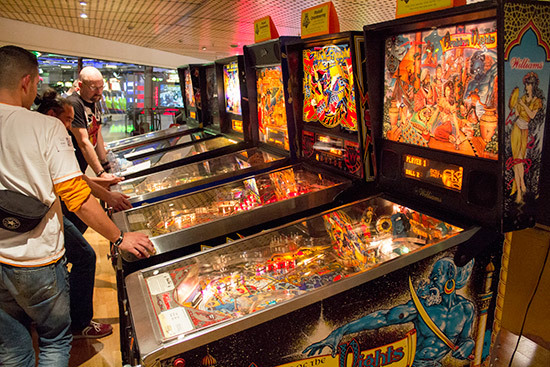 Each player was allocated four machines to play during their time slot in each tournament. There was no choice of machines to play, so it was the luck of the draw whether you got machines you knew and/or liked to play, or not. 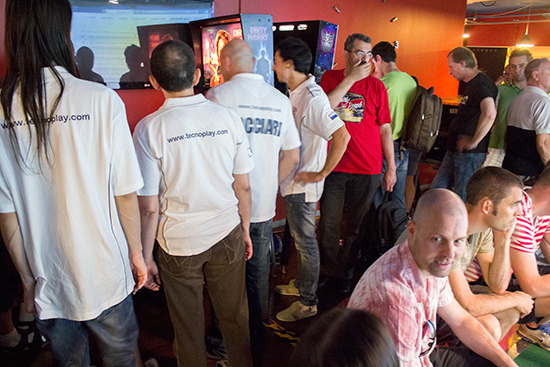 The games each player had been allocated were shown on the projector screens in the entrance room and also on printed sheets, with EPC and Classic Tournament machines combined. 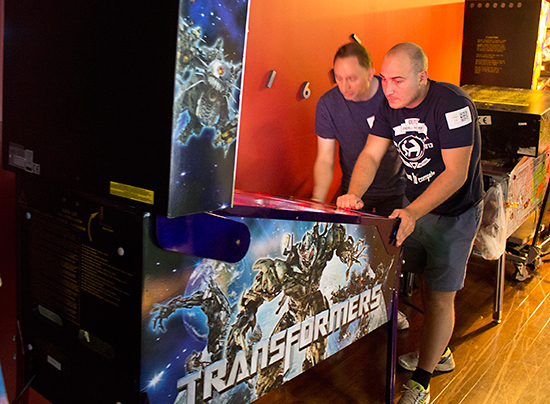 Two players were allocated to each machine, and they usually played their 2-player games together. It wasn't mandatory to play together during qualifying, and some players preferred to play alone. 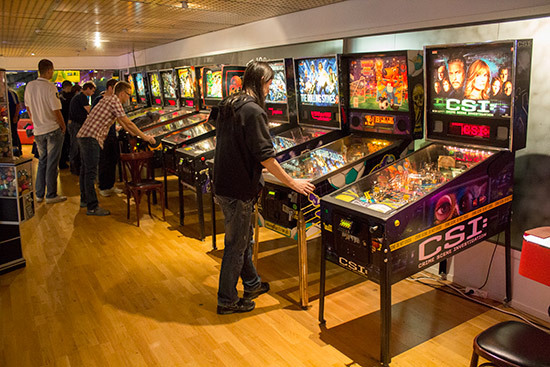 Some of the Classics machines could only be played as one-player games to prevent stealing of locked balls or other features. 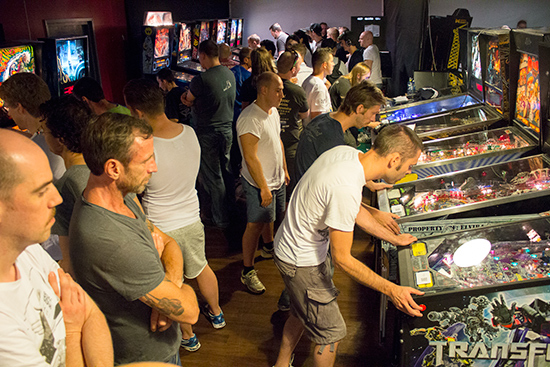 In both tournaments everyone got to play their four allocated machines twice, with the best score of the two games counting. Those eight games constituted a player's one and only entry in the tournament. Ranking points were awarded depending on how a score compared to all the others on the same machine, with between 107 and 109 points for the top score depending on how many people played that machine, and around 2 points for the lowest score. The total of the ranking points on all four machines gave a player their overall qualifying score. 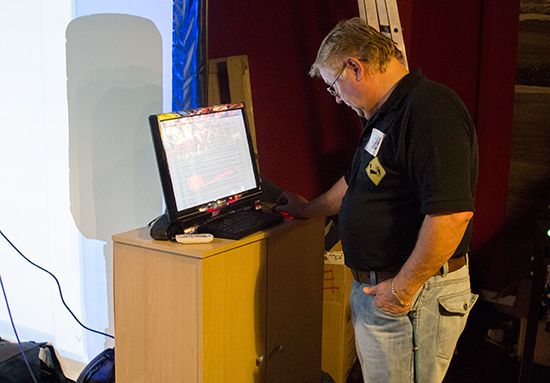 Individual and overall rankings could also be checked on two computer terminals either side of the screens, although these were also controlling what was shown on the two side screens. Scores were recorded using a new app running on Android phones and tablets. Each player was given a badge with a QR code. 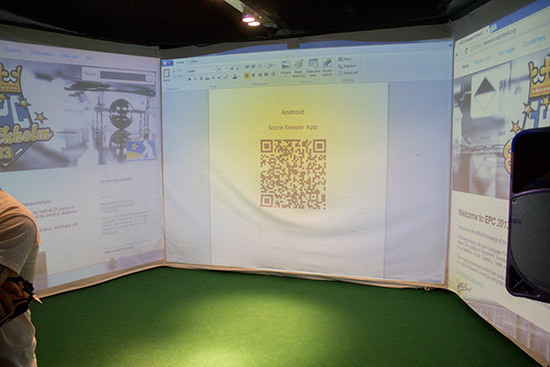 The machines also had QR codes, and to register a score, the scorer used the phone's camera to scan the machine's QR code followed the player's code. They then typed in the score and pressed a button on the screen to record it. The system generally worked well, although there were a couple of moments where the network went down and no more scores could be recorded for a few minutes. Qualifying continued until 11pm on Friday, picking up again on Saturday morning when the doors opened at 10am. 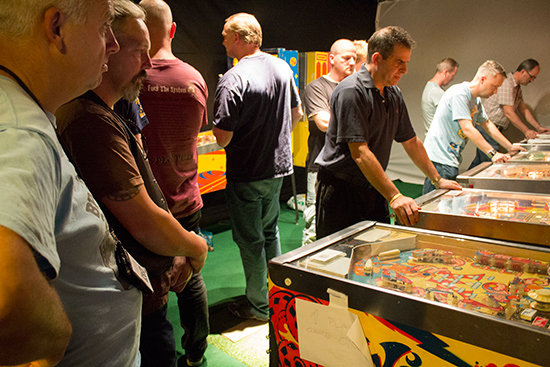 With more players choosing to play on Saturday, the competition area soon became quite crowded and the air conditioning struggled to cope with the combined heat generated by the competitors and the machines. 1pm on Saturday was the scheduled start of the two team tournaments. IFPA Country Directors in each country could register a national team to compete in one tournament, while other players were free to form their own teams to compete in a second, separate event. Both team tournaments actually began nearer 2pm. Somewhat surprisingly, the already-crowded reception area also played host to the two tournaments. Eight machines were set up there - a bank of three on the right, another three on the left, and two more set against the wall. 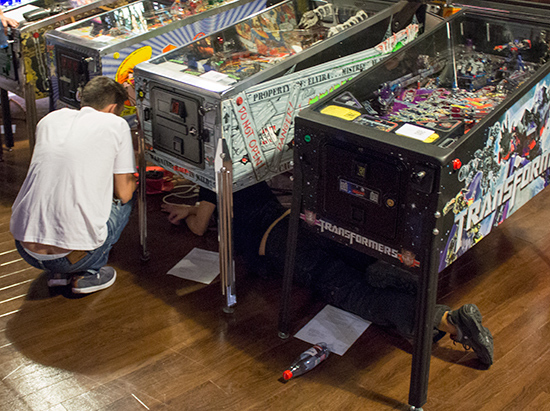 Each team was allocated three machines to play. 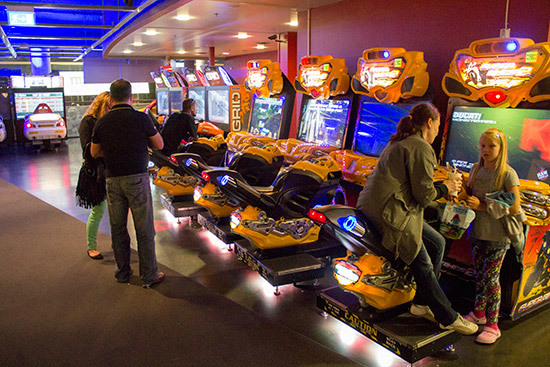 The four players in each team divided into two pairs and each pair played split-flipper on one of the three machines. They played two 4-ball games in this way, and the highest score of the two was recorded. 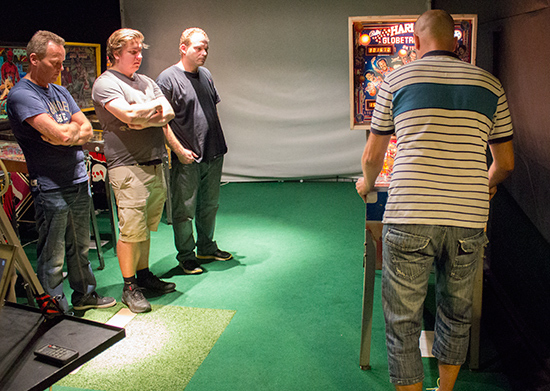 All four players then played two games on their third machine with each team member playing one ball in each game. 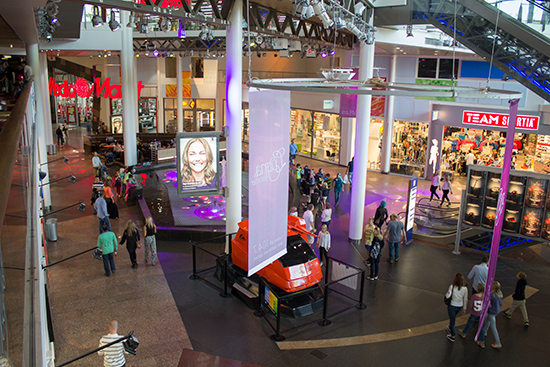 Teams could choose which two of their three machines were played split-flipper and which one was played by all team members. There was a three-way play-off for the last two qualifying places in the National Team Tournament between the UK, Netherlands and Poland. In the end it was the UK and Poland who progressed to play Denmark and Sweden in their respective semi-finals. 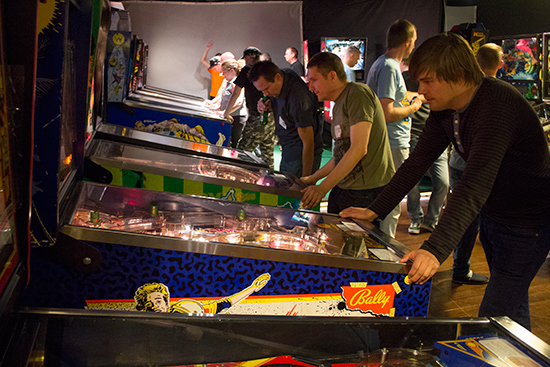 The semi-finals and finals were played in the same way as the qualifying games, with two split-flipper games played and a third game where all team members played one ball. 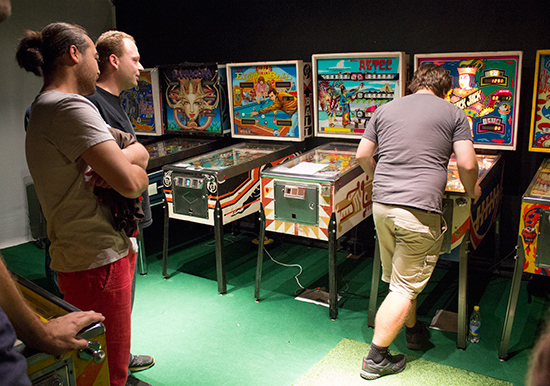 However, the third game was only played if both teams each won one of the split-flipper games. If a team won both, they had won the round and the third game was not played. The two semi-finals brought wins for Sweden and the UK, leaving Denmark and Poland to play for third place. 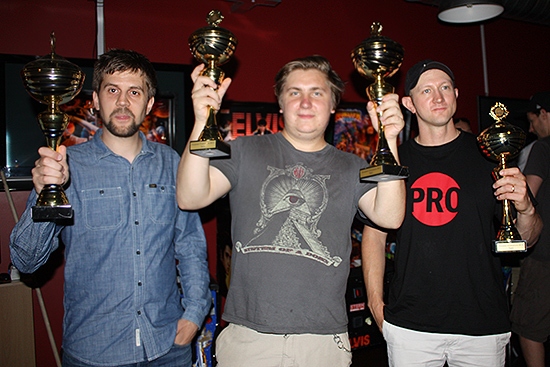 The final brought a fairly easy win for Sweden, who won both split-flipper games on Terminator 2 and Monster Bash to take the title of EPC National Team Champions. 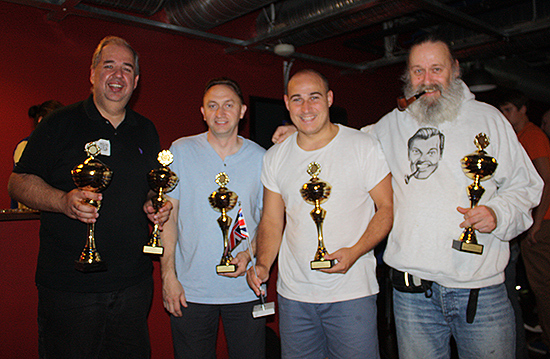 The UK were second, while Denmark defeated Poland in the play-off for third. Each team member from the top three teams won a personal trophy, while there was another for the whole team. 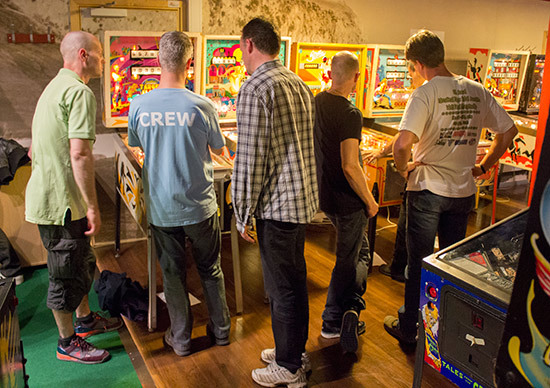 The Open Team Tournament play-offs ran alongside the national versions, with West Coast Pinball playing Gammel Dansk in one semi-final, and Stockholm Underground Pinball playing Uppsala Pinball in the other. 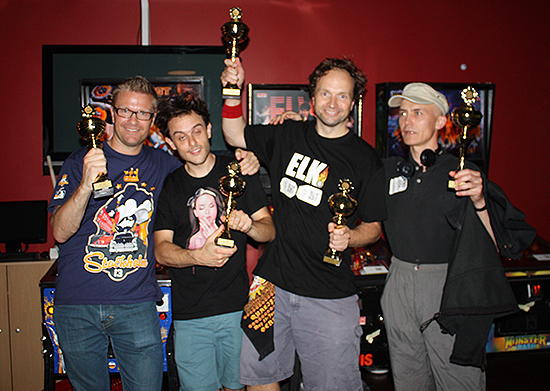 West Coast Pinball and Stockholm Underground Pinball were the victors and went into the final, while Gammel Dansk and Uppsala Pinball played for third place. 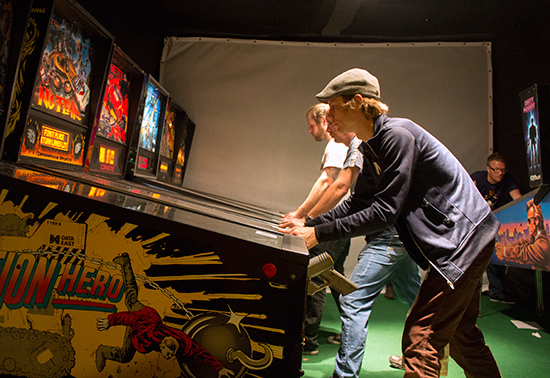 Local team Stockholm Underground Pinball won the final, played on Mousin' Around, Transformers and Jackbot. 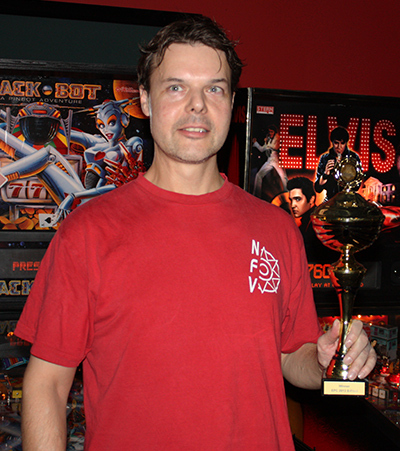 Fellow nationals, West Coast Pinball were second, with Uppsala Pinball winning the third place play-off. While the two team tournaments had been playing out in the entrance, the last rounds of qualifying in the Classic Tournament had been taking place in the main competition area. When all the matches had concluded, the qualifying results were revealed. The top 64 players went through to the play-offs, with the top 16 receiving byes through the first two rounds and players ranked 17-32 receiving a bye through the first round. The first round of play-offs featured players ranked 33rd to 64th - 32 players - who played best-of-three head-to-head matches on a single randomly-selected machine. That reduced the number of players to 16, who were then joined by players ranked 17th to 32nd (who had one bye) to play in the next round. The 16 who survived the second round were joined by the 16 top-ranked players for the third play-off round where the same format continued. 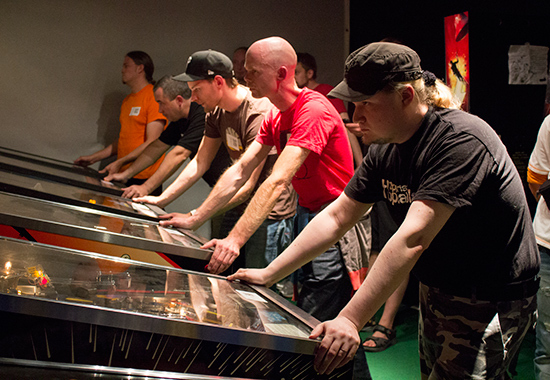 The 16 survivors from that round continued playing best-of-three head-to-head matches, but from this round on, the three games were played on different randomly-selected machines. Due to time constraints, the final of the Classic Tournament was held over to the Sunday, when the four finalists - Levente Tregova, Martin Tiljander, Patrik Lindberg and Fredrik Malmqvist - convened to play the final. As in earlier rounds, it was played over three games, with 4 points awarded for a win, 2 for second place and 1 for third. Whoever had the most points after the three games would be the winner. 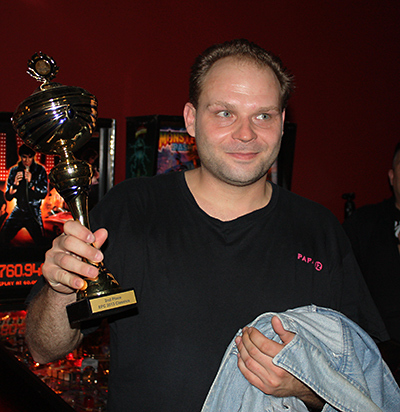 After coming back from a difficult start, Fredrik went on to win on Black Jack with a score of 179,740. Levente was second on 137,440, Patrik third with 72,200 and Martin fourth on 9,860. 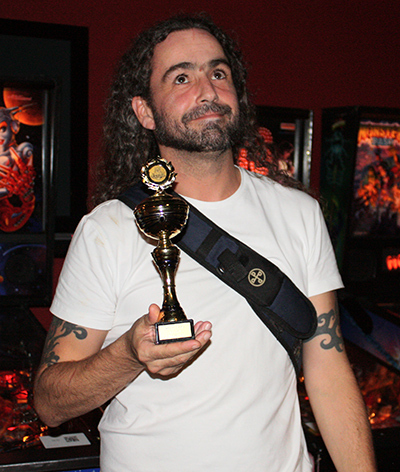 Play then moved on to Space Invaders, and this time it was Levente's turn to take top spot, with Fredrik in second. 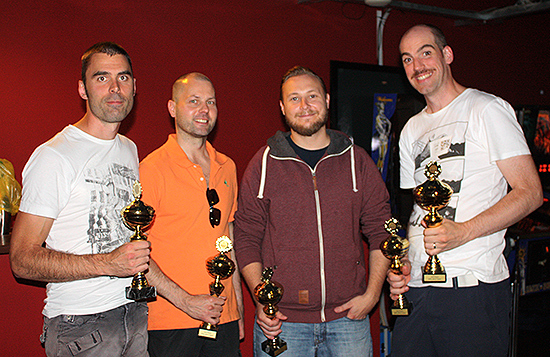 Thirds and fourth places again went to Patrik and Martin respectively. So with one game remaining, Levente and Fredrik both had 6 points. Patrik had 2 points and so couldn't win, while Martin had yet to score. That meant whoever finished highest out of Levente and Patrik would be the winner. The last game of the final was Harlem Globetrotters. As they reached the last ball, Levente lead by 13,000 from Martin in second, Patrik was third and Fredrik last, with just over half Levente's score. Levente finished his third ball on 317,870. Then it was Fredrik's turn, and it was clear his score was going to be close to Levente's. As his bonus counted up, it passed the 300,000 mark, continued climbing and ended on 319,180 - a mere 1,310 ahead, but enough to give him the overall win in the final. 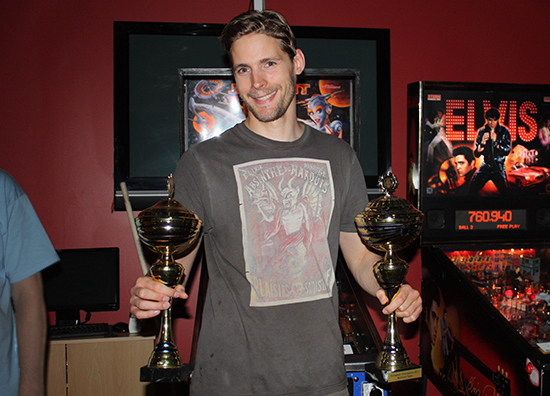 Martin's score overtook both of them and he won the game, moving him to third overall, with Patrik in fourth. Meanwhile, the qualifying rounds in the main EPC tournament came to a close just before midnight on Saturday as the final games of the day were played on Spider-Man, which had been out of action earlier in the day due to a board fault. That delay, and the fact that games on Spider-Man are usually quite lengthy, led to a backlog which was finally cleared just before the venue closed for the night. 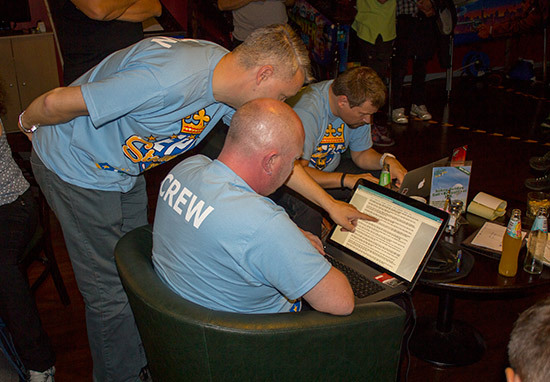 With the last scores entered, the qualifying results were finalised. As with the Classic Tournament, the top 64 players qualified for Sunday's play-offs, but due to the high number of entries it was decided to create a B Division for players ranked 65th to 128th. As before, the top 16 qualifiers in each division received a bye through the first two rounds, while the next 16 had a single bye. Those who had qualified had to be back at the venue at 10am to sign-in for the play-off rounds. 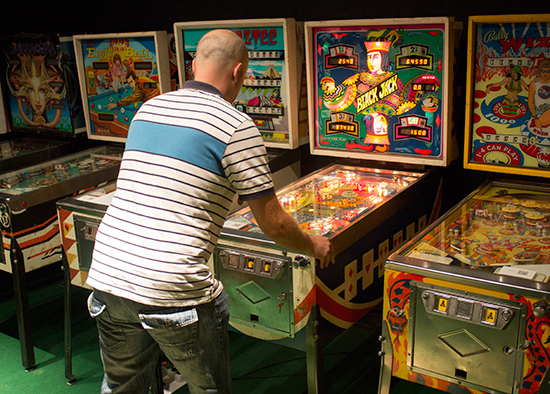 When play began around 11am, the format was the same one used in the Classic - the best-of-three games, all played on the same machine. 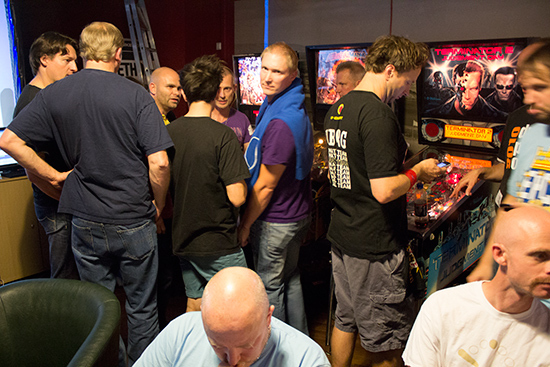 This continued through the first few rounds, until the number of players remaining was small enough to allow the use of multiple machines without making players wait between games. The main and the B division play-offs ran concurrently, which kept the tournament area busy throughout the first few rounds until the numbers remaining started to drop. Unlike the Classic Tournament, the main EPC continued in a head-to-head format right through to the final. In that final was Sweden's Jorian Engelbrektsson, who lost only one game in his four play-off rounds, having skipped the first two rounds by finishing top in qualifying. Also in the final was the number two qualifier, Krisztián Szalai. He too only lost one game in the play-offs, so the two appeared well-matched as they prepared for the best-of-three games final. 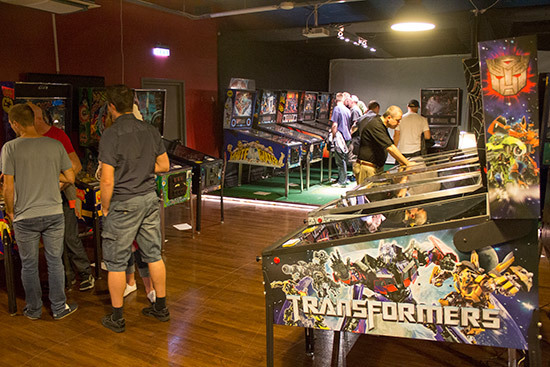 Held in front of the projector screens in the reception area, the final would take place on three machines - Tron, Attack from Mars and AC/DC - which had been moved from the competition area for the final. Whoever won two games would be the new EPC champion. Due to the late hour, a number of competitors had left for their journey home, but a sizeable crowd still remained to see the culmination of the event. After taking the lead by winning on Tron, Jorian had the opportunity to wrap up the final in two games if he could put in a repeat performance on one of his favourite machines - Attack from Mars. 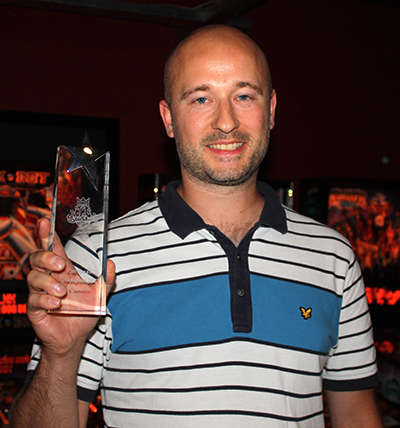 True to form, Jorian reproduced his earlier achievement on Tron to triumph over Krisztián on Attack from Mars, winning the final 2-0 and becoming the EPC Champion for 2013. In the play-off for third place, Philippe Bocquet defeated René van Gool. In the B Division, the final brought together Anders Carlsson from Sweden and Mark van der Gugten from the Netherlands. Both had received two byes thanks to their high qualifying positions, and both dropped two games on their way to the final, so a close match was expected. And so it turned out. 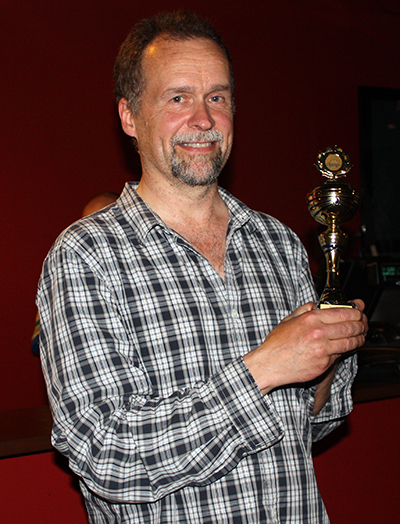 After playing two games it was one win each, but the deciding third game was won by Mark, giving him the B Division Champion title. 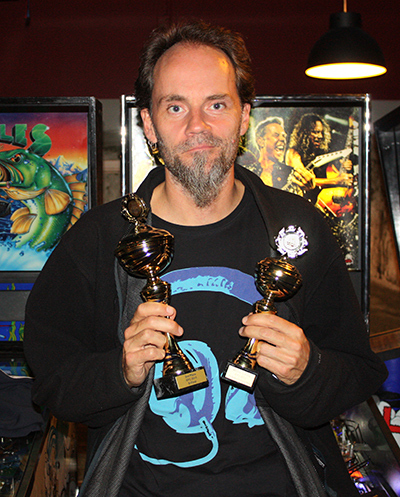 In the play-off, Klas Hellström beat Bo Mertins to secure the B Division's third place. 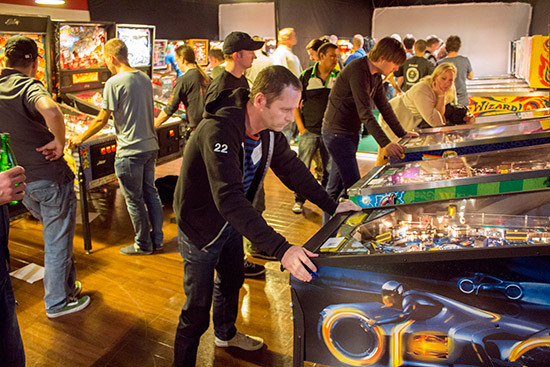 The EPC, Classic and Team tournaments weren't the only competitive events at Heron City, because a number of side-tournaments were held in the recreational play area, starting on Friday with the One Minute Pinball event, where players had sixty seconds to score as many points as possible on Mata Hari. 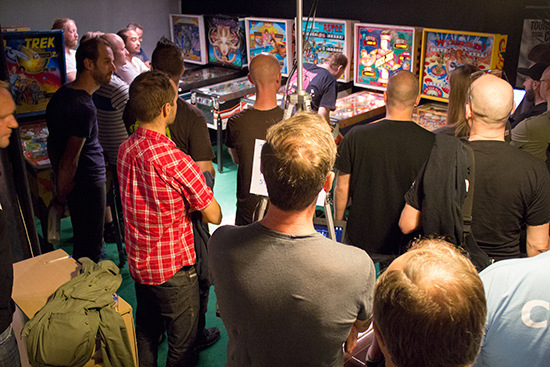 The winner of One Minute Pinball was Victor Håkansson, who amassed 151,430 in his one minute. 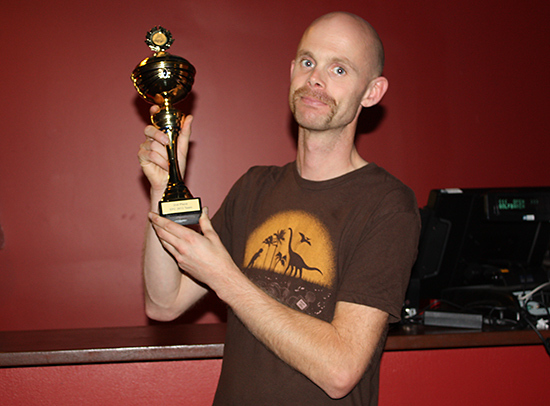 The winner, achieving all three objectives in just 57.1 seconds was Rolph Ericson. 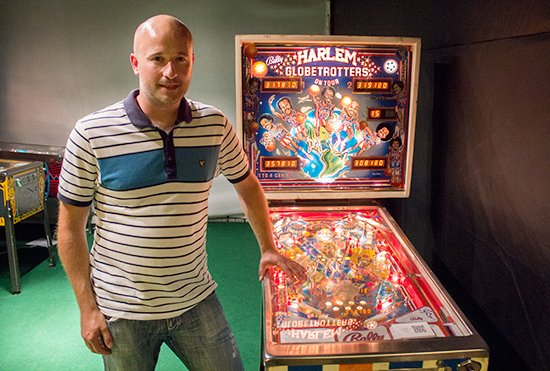 On Saturday, One Minute Pinball returned, moving from Mata Hari to Harley Davidson. 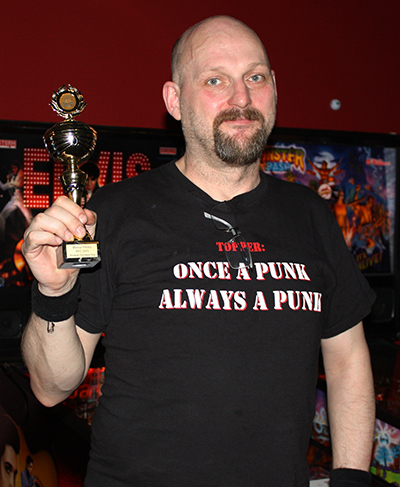 This time the winner was Andreas Frid with his score of 50,881,950 points. 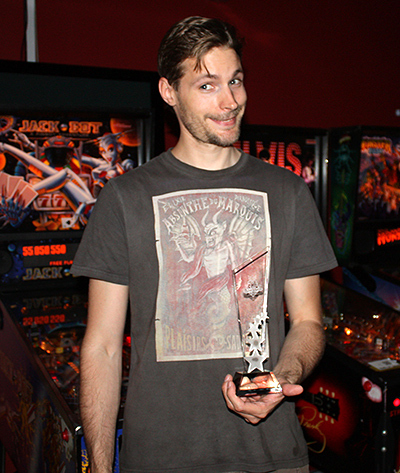 Pinball Orienteering was also back on Saturday's when the winner was Johan Wadelius. 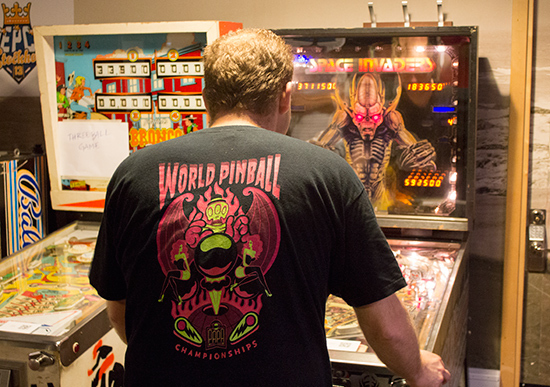 By Sunday, One Minute Pinball had moved to Tales of the Arabian Nights where Anders Birgersson won with 3,578,420. Anders Carlsson triumphed this time with his time of 1 minute, 24.6 seconds to complete all three features. In addition, two side-events ran across the full three days. 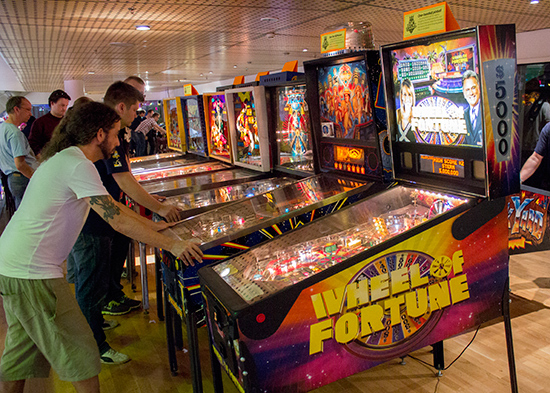 One Handed Pinball was a high score competition played on Wheel of Fortune. 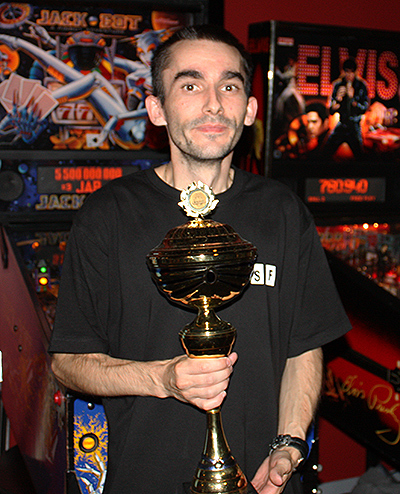 The highest score here was achieved by Michael Trepp with 30,639,400 points. 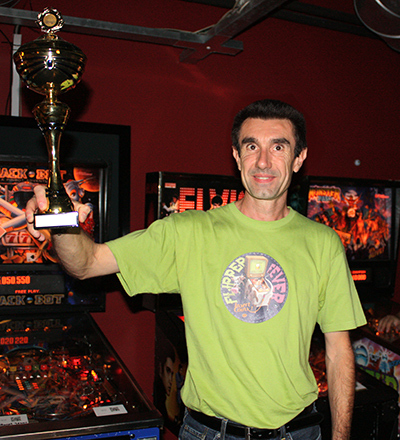 A regular high score competition was run on Doctor Who, and it was dominated by Daniele Celestino Acciari who looped his way to 3.8 billion. 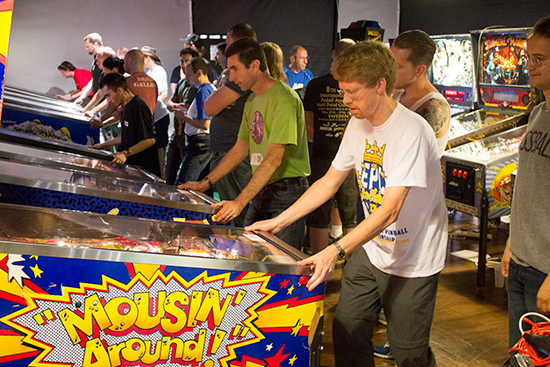 Those results bring us to the end of this year's European Pinball Championship. 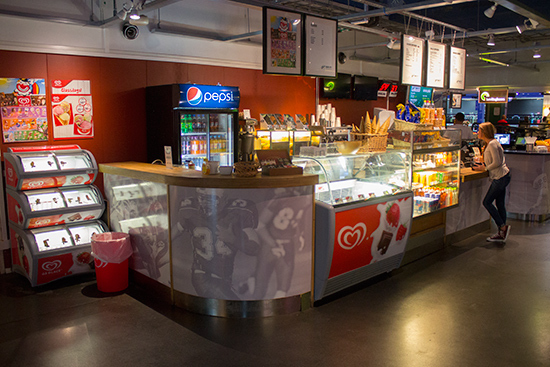 The venue was a good one, with plenty of facilities offering food, drinks, sports and other entertainment within the same building. Travel to Heron City was quite painless, with a choice of full-service and budget airlines serving the city's two airports. The cost of many things in Sweden appears high to foreigners, and overall that was borne out here at O'Learys. Small bottles of water cost inside the tournament area cost SEK25 ($3.93, €2.90, £2.43), but thankfully iced tap water was available from the main bar for free and some good value alternative drinks were available if you spotted them on the menu. The temperature in the playing area did rise above the comfortable for long periods on all three days, as the air conditioning struggled with the number of bodies packed in there. So it was slightly disappointing to see both bars and the restaurant stop serving thirsty or hungry customers at 11:30pm on both Friday and Saturday nights, just as players were finishing their games for the day and wanted to either celebrate, commiserate, or just rehydrate with fellow competitors. The only other negative was the long and often unexplained delays throughout the weekend. Events would routinely start an hour after their scheduled start time, while play schedules were worked out which could have been planned days or weeks in advance. As it was, we had to leave to catch the last flight home of the day, and the main tournament hadn't even reached the quarter-finals stage. On the plus side, the condition, set up, and reliability of the machines was excellent. Only Spider-Man suffered any extended down-time, and that was due to a board fault which necessitated a replacement driver board. There was a short power outage for one bank of four machines, but the problem was efficiently repaired and the machines quickly brought back into action. Nearby accommodation and parking was good too, but perhaps the best part was the warm welcome from local players and from the event organisers. Many competitors also helped with scoring and registration, and were well rewarded with a free meal and drink in the restaurant. 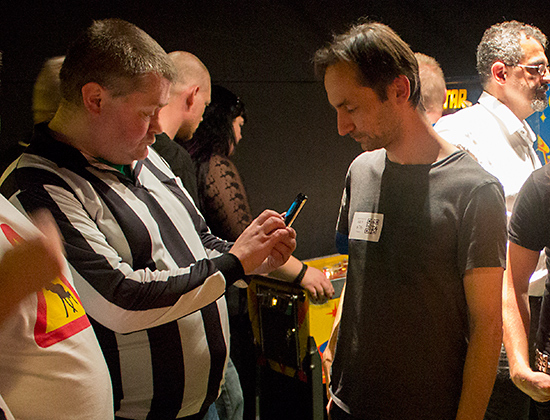 The scoring system using the scanning of QR codes on players and machines worked well, and really helped avoid incorrect entries. The display of the results on the screens was not so clear, and could have done with some simple formatting from a designer of informational graphics (ahem!) to make things clearer. But from feedback it is clear the on-line feeds of live video and qualifying results were greatly appreciated by those who couldn't attend. So congratulations to everyone involved in organising and running this year's EPC. With a record number of competitors, you managed to create a challenging, entertaining and fun event for everyone taking part. We'll leave you with our exclusive Three Minute Tour, our video walkthrough of the competition and recreational areas shot on Sunday lunchtime after the Classics had concluded. 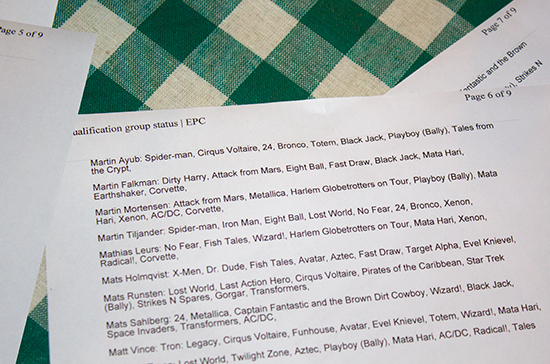 Thanks to the EPC 2013 organisers for all the results information. The next EPC will be held in Rimini, Italy in March 2014. Check out our Diary page for more details of this and other tournaments around the world.